Cage Warriors Academy South East report and results: Tanasa title win caps an epic night of fights. Local favourite George Tanasa lifted the Cage Warriors Academy South East lightweight title in a matter of seconds to cap an epic card of mixed martial arts action which showcased some of the best amateur talent in Europe last night. Romanian Tanasa (now 4-1), who fights out of Colchester’s powerhouse BKK Fighters Gym, showed exactly why head coach Jack Mason is tipping him for big things as he blitzed through foe Nathan Philpott in just 41 seconds, via a ground-and-pound TKO. But it was a mixed night for his BKK team-mates on a bumper 28-fight card at the Charter Hall in Colchester, which attracted a large and vocal crowd. BKK’s James Farn thrilled the home support in a fight of the night showing against Matt Rodgers, taking a split decision win after a back-and-forth welterweight clash which saw him staggered in the second round and then so close to forcing a tap in the third. There was disappointment too for BKK’s Ipswich lightweight Adam Spalding, who was controlling the first round of his battle with banger Phuong Tran until a head-kick rocked him and, despite showing huge heart in the face of heavy artillery, he was stopped with seconds to go in the stanza. Ben Iontton, another off the BKK production line, also fell to defeat, succumbing to a second round rear naked choke in a bantamweight clash with Luke Bennett. There were seven amateur title fights in all on the night, with Tanasa’s triumph the headline. Charlotte McIntyre became a two-weight champ with a bantamweight decision win over Arziko Bregu, while Jon Vetle Furuheim did the same by lifting the junior 135lb title with a third round stoppage of Markus Haegland. Stefano Morotti defended his featherweight belt in style, forcing a verbal submission from Hamza Hindy in just 50 seconds, while the super-talented Ollie Sarwa unloaded a late barrage of kicks and punches to stop bantamweight champion John Parthaugen in the third round. In the other title fights, Ismar Blagoje lifted the light-heavyweight strap in just 54 seconds, and Jorgen Indsetviken retained his welterweight title with a third round rear naked choke submission of James Vandergheynst. There was also the small matter of three semi-finals in the Cage Warriors amateur grand prix - with Muhidin Abubakar (flyweight), Jack Eglin (bantamweight) and Oban Elliot (welterweight) winning through to their respective finals at the spectacular Cage Warriors 100 event in Cardiff on December 8. Abubakar can also lay claim to the submission of the night, as he put on a masterclass of transitions between triangle and armbar attempts against Alex Boyd, before securing the tap to the armbar in round two. Teenager Eglin was impressive too on his way to a solid unanimous decision win over the game Francesco Lo Galbo, while Elliot looked tremendous as he blew through opponent Jamie Ward like a storm in just 39 seconds. Special praise must also go to Molly Lindsay, who showed perhaps the best angles and movement of any fighter on the night – as well as a laser-guided missile of a right hand – in her unanimous decision win over the very tough Camilla Bergstrom at bantamweight. 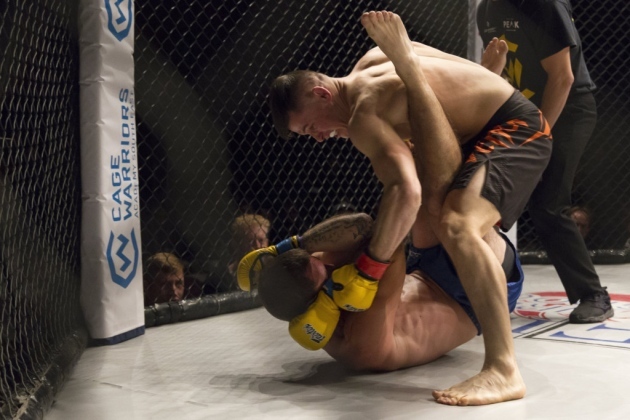 Lower down the card, other highlights included a nuclear left hook knockout from Dan Collins in a first round welterweght win over Dawid Wrobel, while Kacper Wrobel tapped Charlie Wright to a terrific triangle submission after just 43 seconds.